Mark Rayner covers a drab concrete courtyard with an eye-catching water feature. You will need: 3 tall terracotta pots , one small terracotta pot 100 (approx), reclaimed bricks, four lengths of tanalised wood (900mm x 200mm x 25mm), exterior construction glue, exterior filler, sandpaper, hammer, drill, 40 small flat-headed galvanised nails, 40 galvanised nails (100mm), a 1.5m length of 12mm clear plastic tubing, 15mm plastic male coupling, galvanised hose clip, silicon sealant, Knead It adhesive, plastic garden trellis, heavy duty plastic polythene (60cm x 160cm), water pump, smooth bottle, glass or pumice. Resene Concrete Clear, Resene Quick Dry acrylic primer undercoat and Resene Lumbersider in Resene Deep Koamaru. 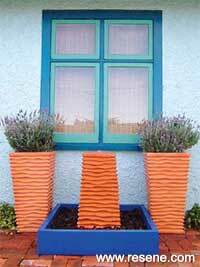 To get the look: Mark used 800mm high rippled terracotta pots available from King’s Plant Barn. Pots are planted with Lavandula dentata. 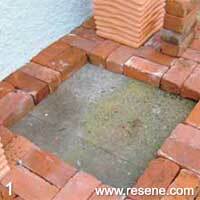 Sweep existing concrete and lay reclaimed bricks in a basket weave pattern, leaving a square gap, as shown. Position two of the large terracotta planters against the wall. 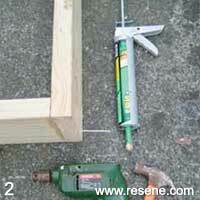 Construct a square base frame from the four lengths of timber using glue and nails. Fill any imperfections with exterior filler. Once set, sand and prime with Resene Quick Dry Acrylic Primer Undercoat‚ then paint with two coats of Resene Deep Koamaru. Fix plastic tubing to the base of the small terracotta pot using the plastic male coupling, silicon sealant and galvanised hose clip. Allow sealant to cure overnight. Mix Knead It adhesive according to manufacturer’s instructions and glue the small terracotta pot over the hole on inside base of the remaining large terracotta pot. Use bricks to hold in position until Knead It dries (about an hour). 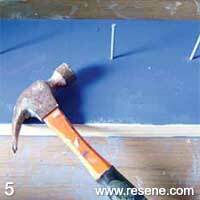 Hammer a level row of galvanised nails along each inner edge of the frame, then attach black polythene to the frame using flathead galvanised nails. Lay the frame with the plastic lining over the gap in the bricks and fill with water. 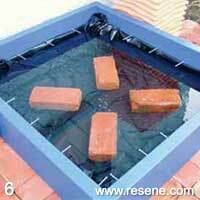 Position four bricks and stand terracotta pot upside down in the centre of water feature’s base. 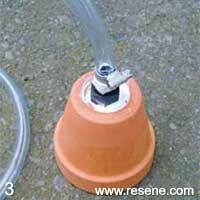 Attach the other end of plastic tube to the water pump and submerge under front edge of terracotta pot. 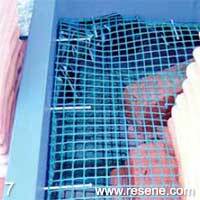 Conceal wire along back edge of base frame. Cut a square of plastic garden trellis to fit around the base of the terracotta pot, resting it on the bricks and nails for support. 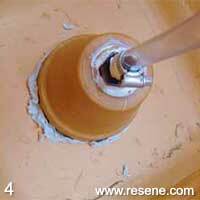 Touch up any damage to paint and apply one coat of Resene Concrete Clear to base frame. 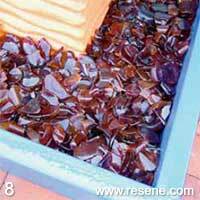 Once dry, cover the plastic trellis with a layer of smooth bottle glass or pumice. Turn on the water pump and enjoy!